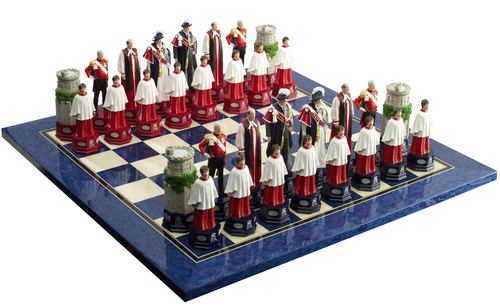 If you are looking for a luxurious and unique Christmas gift that can be passed down through future generations as a reminder of a wonderful historical celebration, consider a beautiful, hand painted chess set to commemorate HM The Queen’s Diamond Jubilee in 2012. For over 40 years Studio Anne Carlton has been associated with producing traditional, hand crafted chess sets and now this well respected English company is proud to celebrate the heritage of its nation. On 1st October Studio Anne Carlton will launch their Diamond Jubilee Chess Set, celebrating 60 years since Her Majesty The Queen’s accession to the Throne in February 1952. This year Americans joined the British in rejoicing in the pageantry of a Royal Wedding, the nuptials of Prince William and Catherine Middleton. In 2012 there will be an opportunity once again to be part of a truly historical Royal occasion, the Diamond Jubilee of HM The Queen. The commemorative chess set was designed in association with St George’s Chapel at Windsor Castle and features beautifully hand painted figures including The Queen and The Duke of Edinburgh. The Rook is modelled on the famous Round Tower of Windsor Castle which dates back to the late 12th century. The pawns represent the choristers of St George’s Chapel, Windsor. Every chess set also includes a Parchment Certificate. The Diamond Jubilee chess set makes the perfect Christmas gift that is set to become a family heirloom and a piece of Royal history. The figures of HM The Queen and the Duke of Edinburgh have also been produced as individual collectable pieces, available in a commemorative gift box and both the chess set and the figurines are available to purchase directly from the Studio Anne Carlton web site www.sac-games.com and leading retailers. Studio Anne Carlton has spearheaded the design, production and marketing of chess sets and classic games since 1969. The SAC collection showcases the world’s leading brand of decorative chess sets, spanning subjects from Isle of Lewis to Battle of Hastings and from Lord of the Rings to Peter Rabbit. SAC offers one of the most comprehensive ranges of classic games on the market today including chess, backgammon, compendiums, dominoes and roulette. These products make the perfect gift, both for the traditional games enthusiast and for the person who just likes to play with friends at Christmas. This press release was distributed by ResponseSource Press Release Wire on behalf of Friday's Media Group in the following categories: Leisure & Hobbies, Home & Garden, Media & Marketing, Retail & Fashion, for more information visit https://pressreleasewire.responsesource.com/about.